Little Big Guardians is coming! Don’t miss the exciting competitive game in Lego style and MOBA mobile game! 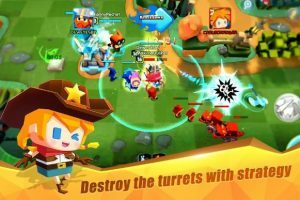 In this game you can not only pick different cute heroes, freely match your clothes, but also choose a variety of game modes: Fast-paced FFA, team battle and so on. It meets all your needs! Cupid bow, lollipop sledgehammer, burger grenades ……Match these weapons as you like. In addition, get all clothes for free! Come to open a fashion party that just belongs to you! Hi under Nexus 6 just exit of the game after load resource on loading screen so never see the game inaction fix it !